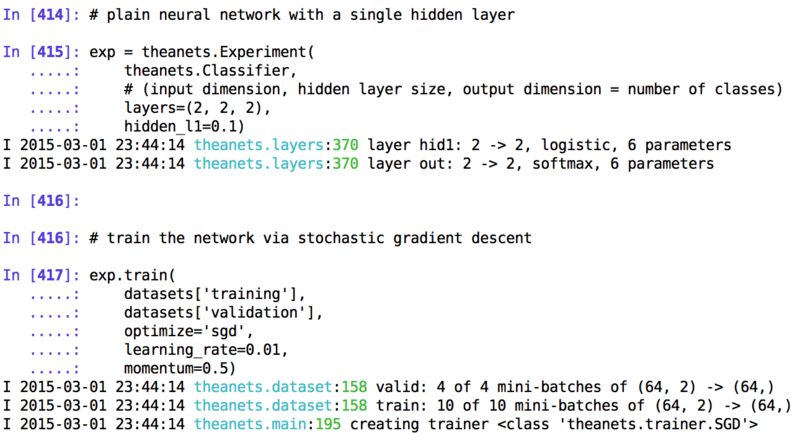 How to train a simple neural network with the theanets library in a few lines of code? In this working example we generate simple synthetic data, create a classifier, train it and evaluate it. Then you can start with your own experiments with much more powerful networks. It assumes knowing a bit of theory of machine learning and neural networks. After the Andrew Ng's Machine Learning course at Coursera you shoul feel at home. Why neural networks and theanets? Neural networks are a very powerful tool in machine learning. Recently with the advent of deep learning architectures and efficient algorithms for training them, deep neural networks allowed solving complicated problems such as speech or face recognition with state-of-the-art results. Thanks to vast amounts of training data, GPUs (pocket-sized super-computers) and a lot of software available we can apply deep neural network models to problems in many domains. However, a difficult problem for a beginner is to start and get the algorithm working. There's an abundance of papers and software libraries available and it might be hard to decide where to start. Although it is possible to write a some neural network model from scratch there's a lot of tricky details so it's much easier to pick a some existing library and learn from it as much as possible, and later extend it or write one's own implementation. In this article we'll go through a basic example of using the theanets library which allows to build and train various neural networks on top of the theano compiler. Altough we write pure Python code Theano compiles it and allows to run the code either on a CPU or a GPU (it also takes care of automatic differentiation, memory management and other goodies). Theanets then allows to build models of neural networks with various architectures (shallow/deep, feed-forward/recurrent), activation functions, training algorithms, etc. Besides it we'll use bits of the scikit-learn library, in this case for generating synthetic data and for model evaluation. I was able to install and run theano, theanets and scikit-learns on Python 3.4 on Mac OS X Yosemite. You need the classic SciPy stack (numpy, scipy, matplotlib). Scikit-learn and IPython and optional but recommended. Usage of pyvenv/virtualenv is also recommended. Theano installation instructions. You can either install the release from the repository or the development code from GitHub. Python 3 seems to be supported since version 0.6.0rc5 (not in 0.6.0 - the last "stable" release). The goal is to get familiar with theanets on some simple example. You can modify this example bit by bit to work on more complex data and models. 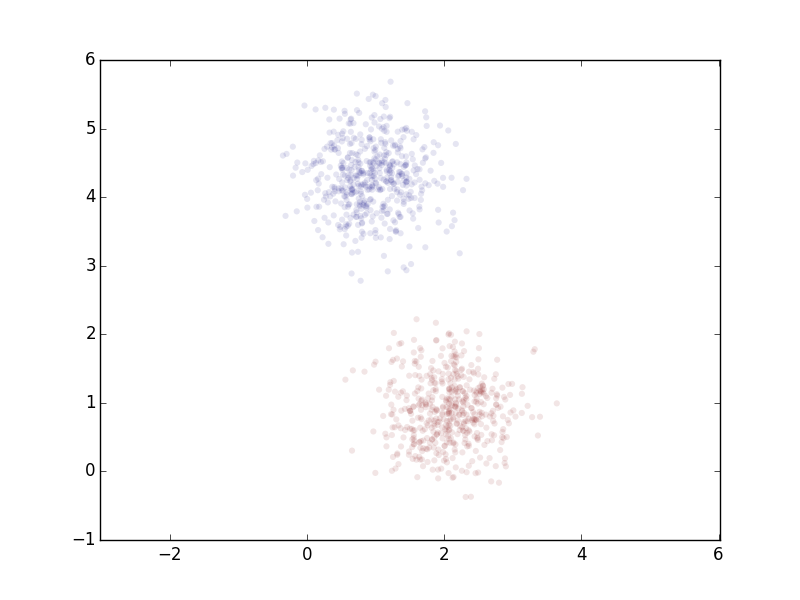 In this example we generate some synthetic data (via scikit-learn) - two 2D blobs with Gaussian distribution which are in addition linearly separable. Thus any classification model should have no problem with such data. We create a neural network with three layers and train it. Finally, we evaluate the model with functions provided by scikit-learn. The complete runnable code from this article is available on GitHub as a single Python script. We prepare very simple data - two linearly separable 2D blobs. We need to convert the features and targets to the 32-bit format suitable for the Theano. It is possible to configure the float precision used by Theano, but 32-bit precision is enough in this case. To get familiar with the data and assure that it is alrigth we might visualize it. In this 2D case it is quite simple - a scatter plot is sufficient. We can make the points transparent and get rid of the border to better see the density. In order to train and evaluate the model we need to split the data set into training, validation and testing set. Training set can be used to optimize general model parameters and validation training set for optimizing some hyperparameters. Testing set can be used only for evaluation of performance on unseen data, never for optimization (including training). Note that for splitting the data must be randomly shuffled, in this case the data was already shuffled when being generated. Scikit-learn provides ShuffleSplit for this purpose. Unfortunately it only splits data into two sets (training, test), not three. So I wrote this simple splitting function instead. Splits the data into training, validation and test sets. First we setup logging and argument handling for theanets via the climate library which it uses. We make a Classifier model and wrap it into an Experiment which allows to train the model. The architecture of the network can be specified via the layers parameter. We create a neural network with three layers - input, hidden and output - each with two dimensions (2D featues, two target classes). The input and hidden layer has by default sigmoid activation, the output classification layer has softmax actiovation by default. In addition we specify a bit of L1 regularization (though in this simple example it is not necessary to prefer a sparser model). Once we created the model we can train it using the provided data. In this case we train the network via the basic stochastic gradient descent (SGD) method. We can specify its parameters quite easily. There's available a lot more optimization algorithms and their options so you can play and don't need to implement everything from scratch. Just consult the docs and possibly extent the code if needed. Finally we look at how good the model is using functions provided by scikit-learn. For classification we can measure precision and recall or combine it into a single f1-score. Also we can compute the whole confusion matrix as it might give us a more complete understanding which inputs were classified correctly (counts on diagonal) and what were the errors. Note that we evaluate the model on against the test dataset, ie. data which was not used for training. Otherwise we would get too optimistic result. In case we're happy with the model, we can use the exp.network.classify() function to classify the data we wish to classify (which is usually the ultimate purpose of training the model). I 2015-03-02 09:04:00 theanets.trainer:253 patience elapsed! As we can see, the model was trained rather quickly and was able to perfectly learn how to classify this dataset. This is due to the very simplicity of this data. In real world the performance is usually not perfect. And the challenge it to train models that are both precise and can generalize well to unseen data. The goal of this tutorial was to get into a running state quickly. In further articles I'd like to provide more complex examples of theanets as well as some real-world applications. If you like this article and would like to be notified you might follow me on Twitter: @bzamecnik. do you see any differences in training speed or classification results? try other machine learning tasks, eg.